We make you and your case our priority. We have the experience and the team to get justice for you. We have the trial experience and the team to get justice for you. To get justice in a civil case, you need a strong and experienced advocate with an excellent team. We have both. We work with small and large business owners. We act as mediators and can help resolves disputes between parties. Divorce is hard, custody disputes are even harder. We listen, we care and we work compassionately to help you move forward. Attorneys: Want help with a challenging case? We have the trial experience and the team to help you win. The Richard Law Firm can help with land use and real estate disputes. The Richard Law Firm helps settle construction lawsuits. If you are being discriminated against or sexually harassed, call us. We can help. We love a challenge and the opportunity to take on trucking companies and their insurance companies in court. 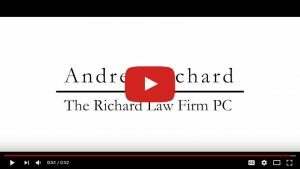 “I highly recommend Andrea Richard and The Richard Law Firm. They are different! They stand up for their clients, work diligently, stay dedicated to resolving issues, and work beyond what is expected.” -- M.O. “Five stars! She is great in the courtroom!” --M.D. “I have worked with a number of lawyers over the last several years and Andrea is the first one that really listened and cared.” –D.W. “As I read one of the documents and that Andrea and her team put together for me, I had to fight back tears. Andrea really heard me and understood me. It is incredibly comforting to finally have a strong and smart advocate on my side.” --S.R. “Andrea and her team take the time to answer questions, prepare clients for all steps involved, and offer outstanding support throughout. It has been wonderful working with The Richard Law Firm.” –S.O. “Andrea is a very smart and strategic thinker. I am SO glad to have her on my side.” –S.W. “Very professional. I have and will continue to refer to Andrea and her team in the future.” –K.M. We are known for our persistence and preparation. We are proud of our honesty, integrity and dedication. We are reliable and we work hard. Most important of all, we have the courage to stand up for our clients. Big-firm Experience. Small-firm Relationships. Although we have big-firm experience, we prefer to work in a small-firm environment that is focused on client service and justice. We work for people who have been wronged. We don’t take frivolous lawsuits. We do not represent large corporations or insurance companies. Check out our “Ask Andrea” video series to get some answers and information about commonly asked law related questions.